The rapid pace of hotel openings in the Dallas Fort Worth area indicate the brisk tourism trade in the two cities – and the expected growth for inbound tourism. There are no less than 37 new hotels in the works in Dallas – either in the planning stages, under construction or just opened. They will be bringing 5,800 new rooms online over the next two years, and 18 of those hotels have opened in 2018. “It’s our job to help fill those rooms,” said Phillip Jones, president and CEO of Visit Dallas, who led a recent tourism promotion mission to Vancouver to meet key suppliers and media. He said that there are also 10 new hotels in the pipeline in Fort Worth, which will be adding 2,000 rooms to the regional inventory. “A huge economic boom is underway,” said the director, noting that Dallas Fort Worth (DFW) has been drawing a significant corporate presence in the recent past, such as the head office operations of Toyota, Liberty Mutual and Lockheed Martin. Air access to DFW, signalling confidence in the market by carriers, was a key talking point at gathering, a lunch time event at the Rosewood Hotel Georgia. They described a strong selection of daily flights on Air Canada, including four from Toronto, two from Montreal, three from Vancouver and two from Calgary. But the bottom line for leisure travellers is in perceiving the quality of the attractions and the culinary offerings being tabled by Dallas Fort Worth. 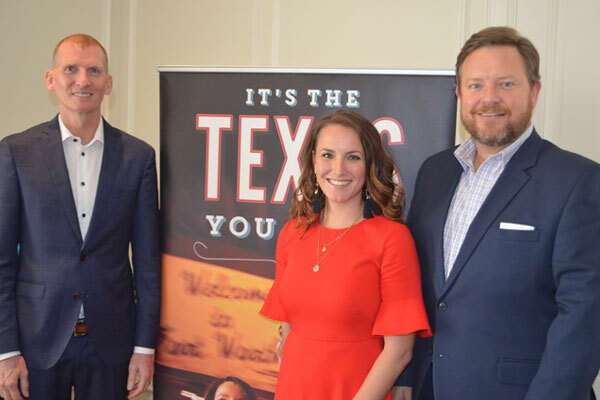 DFW is ticking all the boxes in knowing what is needed to generate tourism demand, said the mission reps.
One of those markets that is especially successful for DFW is professional sports. The city has teams in all the major league sports, including football, baseball, basketball, hockey, soccer and women’s basketball. “We have the best sports in the US,” said Phillip, noting that “America’s team” – the Cowboys – reside at AT&T Stadium in Dallas. The Cowboys have the highest value of any professional sports team, at US$3 billion. He also noted how DFW tends to fly under the radar for some tourists, who have visited the better known destinations in the country, including New York City, Las Vegas, California and Florida – but not Dallas Fort Worth. “It’s the next big one to discover,” he said.